I have seen this Mac problem quite long time ago, and I keep forgetting how I fix it whenever I have it again and again. 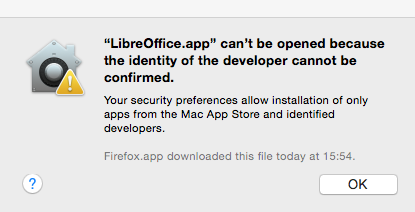 At this time, with Yosemite OS X, I downloaded an update .dmg file from LibreOffice, and when I wanted to open the application, it did say, can’t be opened because the identity of the developer cannot be confirmed. I was able to install the .dmg file, but could not open the application once it was installed. The message itself, “Can’t be opened because the identity of the developer cannot be confirmed” is actually telling us, that the developer of this application is not listed or registered in Apple developer database. This does not necessary mean that the application is bad or corrupt, but it is good that your Mac ‘s Gatekeeper refuses to open it, so you can be careful on what application you are going to open. If you are new to Mac, you can check out what the Gatekeeper on Mac is on Apple website. There are two conditions you probably will see this message, before or after installation. If you see this right before you want to install the .dmg or any extension files, you can right click the .dmg file, and choose “Open“. Enter your Mac password and it will be installed. Below is what you need to do if you can install it but you cannot open the app. How to fix or to run the application after installation? As far as I know, there are 2 ways fixing this to run the application that is blocked by Gatekeeper, but please be sure, that the application is safe. If necessary, do some researches first about the application you want to open. I notice arstechnica wrote about Gatekeeper on this matter too. 1. Go to you Applications folder, find the app, right click or CTRL-click on it, and select “Open“. 2. It will show, “verifying the app” process. 3. Then click “Open” when the dialog box shows after verified. Once it is opened, this app will be opened immediately without refusal from Gatekeeper again. 1. You need to open your “System Preferences”, then “Security and Privacy”. 2. Click the “lock” icon in the left bottom, where it says, “Click the lock to make changes”. 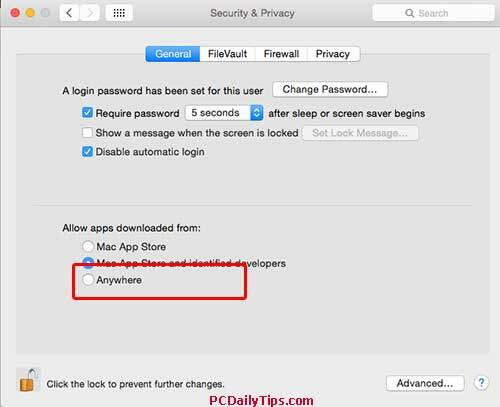 Enter your Mac’s Administrator password to unlock it. Select, “Anywhere”, then click the lock icon again, and open your app. Anywhere option – you need to change it back. 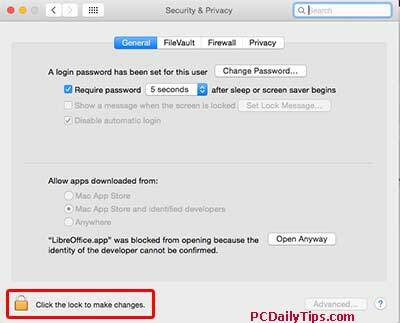 Once it is opened, go back again to the System Preferences, repeat the step, and select back “Mac App Store and identified developers”. With the next app you download from somewhere, you may see this “Can’t be opened because the identity of the developer cannot be confirmed” message again and do the options above.